Post birth, an infant’s physiology must adapt to breathing independently, changes in blood flow and energy access, and a cold environment. Following birth, the newborn’s lungs inflate and respiration begins to occur through the pulmonary system. The subsequent changes to oxygenated blood flow that occur follow the adult pattern of circulation. The energy metabolism of the infant is also quickly converted from a continuous placental supply to intermittent feeding. Glycogen stores created during the second and third trimesters of pregnancy are relied upon for energy during the first few days following birth. Physiological changes occur via thermoregulation to maintain core temperature including: vasoconstriction (a decrease of blood flow to skin), maintaining the fetal position (a decrease of the surface area of exposure), jittery large muscle activity (to generate muscular heat), and non-shivering thermogenesis. respiratory distress syndrome: Infant respiratory distress syndrome (IRDS), also called neonatal respiratory distress syndrome or respiratory distress syndrome (previously called hyaline membrane disease), is a syndrome in premature infants caused by the developmental insufficiency of surfactant production and structural immaturity in the lungs. It can also result from a genetic problem with the production of surfactant-associated proteins. surfactant: A lipoprotein in the tissues of the lung that reduces surface tension and permits more efficient gas transport. non-shivering thermogenesis: The process of heat production in organisms. Non-shivering thermogenesis usually occurs in brown adipose tissue (brown fat) that is present in human infants and hibernating mammals. The first challenge of a newborn is to perfuse its body by breathing independently instead of utilizing placental oxygen. At birth, the baby’s lungs are filled with fetal lung fluid (which is not amniotic fluid) and are not inflated. As the newborn is expelled from the birth canal, its central nervous system reacts to the sudden change in temperature and environment. This triggers it to take the first breath within about 10 seconds of delivery. With the first breaths, there is a fall in pulmonary vascular resistance and an increase in the surface area available for gas exchange. Over the next 30 seconds, the pulmonary blood flow increases and is oxygenated as it flows through the alveoli of the lungs. Oxygenated blood now reaches the left atrium and ventricle and, through the descending aorta, reaches the umbilical arteries. Oxygenated blood now stimulates constriction of the umbilical arteries resulting in a reduction in placental blood flow. As the pulmonary circulation increases, there is an equivalent reduction in the placental blood flow that normally ceases completely after about three minutes. These two changes result in a rapid redirection of blood flow into the pulmonary vascular bed, from approximately 4% to 100% of cardiac output. The increase in pulmonary venous return results in left atrial pressure being slightly higher than right atrial pressure, which closes the foramen ovale. This change in the pattern of flow results in a drop in blood flow across the ductus arteriosus. The higher blood oxygen content of blood within the aorta stimulates the constriction and ultimately the closure of this fetal circulatory shunt. All of these cardiovascular system changes result in the adaptation from fetal circulation patterns to an adult circulation pattern. During this transition, some types of congenital heart diseases that were not symptomatic in utero during fetal circulation will present with cyanosis or respiratory signs. Following birth, the expression and re-uptake of surfactant, which begins production at 20 weeks gestation, is accelerated. Expression of surfactant into the alveoli is necessary to prevent alveolar closure. At this point, rhythmic breathing movements also commence. If there are any problems with breathing, management can include stimulation, bag and mask ventilation, intubation, and ventilation. Cardiorespiratory monitoring is essential to track potential problems. Pharmacological therapy, such as caffeine, can also be given to treat apnea in premature newborns. A positive airway pressure should be maintained and neonatal sepsis must be ruled out. Potential neonatal respiratory problems include apnea, transient tachypnea of the newborn (TTNB), respiratory distress syndrome (RDS), meconium aspiration syndrome (MAS), airway obstruction, and pneumonia. The energy metabolism of the fetus must be converted from a continuous placental supply of glucose to intermittent feeding. While the fetus is dependent on maternal glucose as the main source of energy, it can use lactate, free fatty acids, and ketone bodies under some conditions. Plasma glucose is maintained by glycogenolysis. Glycogen synthesis in the liver and muscle begins in the late second trimester of pregnancy, and storage is completed in the third trimester. Glycogen stores are maximal at term, but even then, the fetus only has enough glycogen available to meet its energy needs for 8–10 hours, which can be depleted even more quickly if the demand is high. Newborns will then rely on gluconeogenesis for energy. Fat stores are the largest storage source of energy. At 27 weeks gestation, only 1% of a fetus’ body weight is fat. At 40 weeks, that number increases to 16%. Inadequate glucose substrate can lead to hypoglycemia, fetal growth restriction, preterm delivery, or other problems. Similarly, an excess substrate can also lead to problems, such as infant of a diabetic mother (IDM), hypothermia, or neonatal sepsis. Anticipating potential problems is the key to managing most neonatal problems of energy metabolism. For example, early feeding in the delivery room or as soon as possible may prevent hypoglycemia. If the blood glucose is still low, then an intravenous (IV) bolus of glucose may be delivered, with continuous infusion if necessary. Rarely, steroids or glucagon may have to be employed. 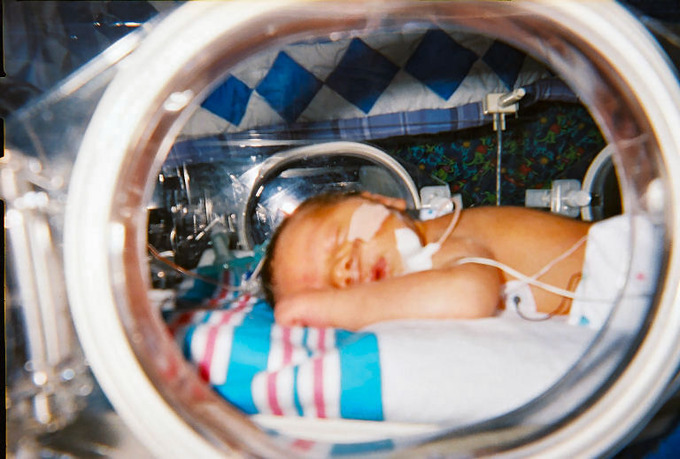 Infant in incubator: Infants, especially preterm infants, have trouble regulating their body temperature. Placement in an incubator allows them to adjust without draining their energy stores. Newborns come from a warm environment to the cold and fluctuating temperatures of this world. They are naked, wet, and have a large surface area to mass ratio, with variable amounts of insulation, limited metabolic reserves, and a decreased ability to shiver. Physiologic mechanisms for preserving core temperature include vasoconstriction (a decrease of blood flow to the skin), maintaining the fetal position (a decrease of the surface area exposed to the environment), jittery large muscle activity (to generate muscular heat), and non-shivering thermogenesis. Non-shivering thermogenesis occurs in brown fat. Brown fat is specialized adipose tissue with a high concentration of mitochondria designed to rapidly oxidize fatty acids in order to generate metabolic heat. The newborn’s capacity to maintain these mechanisms is limited, especially in premature infants.